Hansareisibüroo is a tourism company that is based on 100% Estonian capital. We offer various services: buss rent; insurance; accomodation; holiday offers; bus, ship and plane tickets; ect. 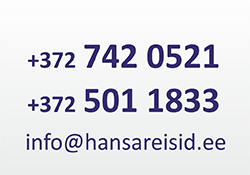 Hansareisibüroo was founded in September 1994 and has been active ever since. We travel to Europe, Scandinavia and Baltic countries! Today we offer wide ranges of services. We cooperate with almost all larger travel agencies. Our priority is to find the best solution for our client and to offer high-quality service! Our agency is situated close to the city center. It is easy to catch us by car or on foot. Come and we will find You the best solution !